After 18km of long, hot, draining paddling, it was the superstar from Starboard who outlasted one of the most elite fields ever seen outside the USA. With a blazing hot Bavarian sun beating down on Week 3 of the Euro Tour, the start of today’s classic Lost Mills distance race was hectic to say the least. With a record 91 guys on the elite race start line space was tight, and there was seemingly-endless jockeying for position as the draft trains began to form over the opening 5-10 minutes. This amazing Lost Mills drone video shows just how wide the field was spread. 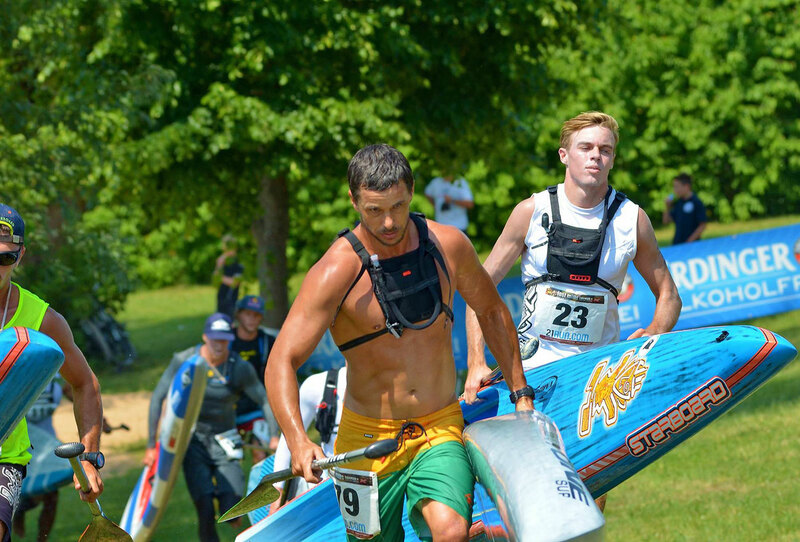 Things had barely settled down before competitors hit their first obstacle, the dreaded “portage run”. In the Lost Mills, paddlers have to exit the water and run 100 metres over to the next lake, do a loop of that second lake, then run back into the first lake and paddle to the start/finish line. These portages are usually where the trains dismantle and that’s exactly what happened today. Early into the second lake, around the 4km mark of the 18km race, a lead group of 16 odd paddlers broke away and never looked back. These 16 guys would go on to fill all the top positions, as first Eric Terrien and then a series of top names set a constant pace that broke the rest of the field. The journey around the second lake, the larger of the two, seemed to go on forever like some cruel mirage. 18km (it ended up being closer to 19) is even longer than it sounds, especially when it’s boiling hot and you’re paddling in dead flat water. What made it even harder was the incredible level of competition at this year’s Lost Mills. The number of international top-tier paddlers wasn’t any larger than what we saw 12 months ago, but the second- and third-tier guys have really stepped it up in 2015. 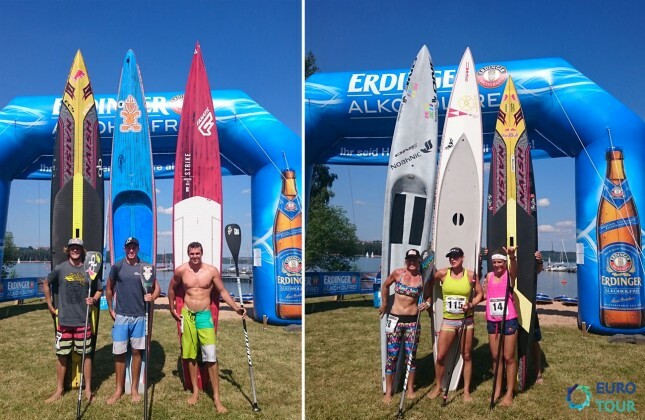 We now have a true “middle class” of high level paddling talent here in Europe, which is fantastic to see. So on and on it went around Lake #2. The top 16 odd paddlers continued to pull away, while behind them the draft trains splintered like an old piece of wood. 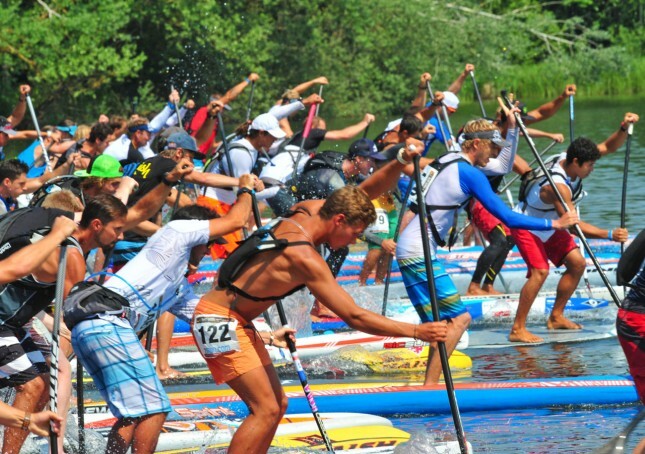 Paddlers began to scatter all over, as we knuckled down for the long, hot journey. By the time this never-ending loop around the second lake was complete, things really started heating up at the front. The lead group had stayed together right up until the 15km mark, but as the top guys made the second and final portage run back into the first lake, it turned into an all out sprint. On the final 3km journey back to the finish line, the top groups broke apart from the increased tempo combined with the tiring conditions. By the time the contest entered the final kilometre, Connor was locked in a four-way sprint to the line with Titouan Puyo, Arthur Arutkin and Trevor Tunnington. None of the final four took the easy route by drafting, each took his own clean water and tried to out-paddle the other three. But in the end Connor found his magic 7th gear when he needed it most, out-lasting a very impressive Titou (how high can this guy go? ), with Trevor (who’s announced his presence on the world stage this week) overtaking Arthur in the final hundred metres. This gives Team Starboard a clean sweep of the men’s podium (and four of the top 10), an amazing feat considering the big names assembled here in Germany. Though a special mention also goes to Team Fanatic, who plucked three of the top 10 spots, with BIC scoring two and SIC picking up one. 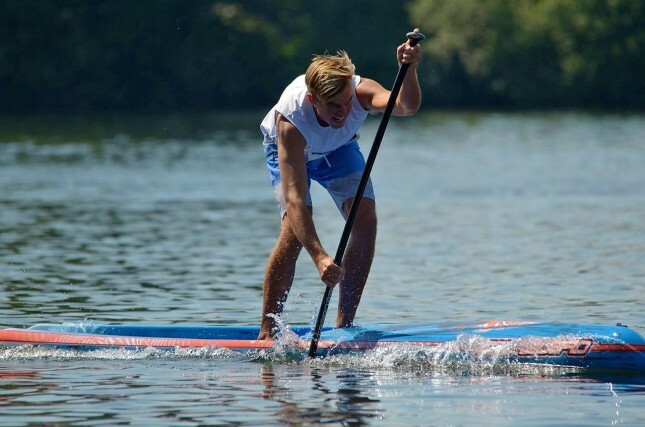 The result also cements Connor’s position as world number one on the SUP Racer World Rankings. Titou moves inside the Top 10 for the first time following his runner-up finish, while Trevor and Arthur both made big jumps courtesy of their strong performances on the lake. In the women’s race it was a two-way battle almost the entire way, with Sonni Honscheid outlasting Angie Jackson. One of the top contenders, Lina Augaitis pulled out pre-race, leaving her two fellow top 10 world ranked women to battle it out. When I looked behind me at around the 13km mark I could see Sonni sitting on Angie’s tail, but I hear at the second portage run that Sonni took off and never looked back. This win continues Sonni’s unbeaten streak in Europe: The German has now swept the first three weeks of the Euro Tour and takes a commanding lead on the Euro Tour Leaderboard as we head to Bilbao for Week 4. Celine Guesdon continued her fine Euro Tour form by claiming third place, though the story of the day was perhaps 56-year-old Carol Scheunemann, who came out of nowhere to beat a few of the international competitors. Carol is a complete unknown outside Germany, but apparently she cleans up on the domestic circuit. Another big effort came from 5th placed Fiona Wylde. Due to some recent health concerns, Fiona barely trained in the weeks leading up to the Euro Tour. To ease yourself back into it with a hot, draining 18km race is pretty damn tough; To do that and finish top five means you’re a pretty tough competitor. So there you go. That was Lost Mills 2015. Summing up the race in one word: Brutal. It was hot and it was long. But it was a great contest. 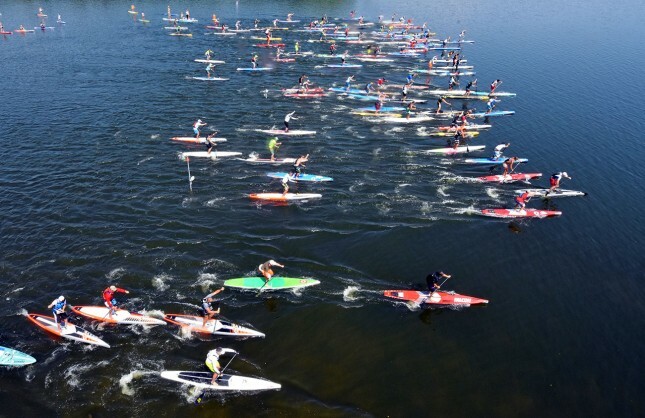 This event still has some work to do before it’s a truly world class affair, but it’s great to see so many talented paddlers competing together in Europe. 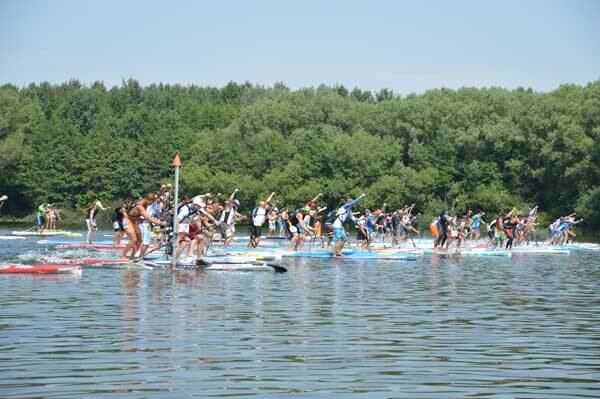 And not just the big names that we all know, but the second- and third-tier men and women that are driving the stand up paddle racing scene in Euro land. Day 2 of the Lost Mills was a bit of a lay day, with a couple of fun little races happening but nothing too serious. Most of the pros were laying low, hanging out at the host hotel, the Strandhotel Seehof, and resting up ahead of tomorrow’s main event. Friday started with the Parallel Slalom race, which was basically yesterday’s 200m course but with a zig-zagging set of buoy turns. Paddlers faced off head to head in a simple knockout format, with the men’s field, missing many of the resting pros, eventually whittling its way down to just three: Connor Baxter, Paolo Marconi and the previously-unknown young gun from Israel, Guy Barel. With a trio still standing, the usual head to head format didn’t work in the final. Instead we saw a round-robin paddle off, with Guy upsetting Paolo (who’s shown some damn fine from on the Euro Tour so far) on the first run, before Connor stepped in and did what he usually does: Win. Paolo and Guy both gave a spirited fight, but the race belonged to the Starboard superstar. To make the final, Connor had to defeat Casper Steinfath in the quarters, which proved to be one of the highlights. We may have unearthed a future contender in Guy though – the youngster looked super quick off the line and around the buoys. Could be a name to keep an eye on. In the women’s Parallel Slalom nobody was really surprised to see Lina Augaitis and Angie Jackson reach the final two. As the fastest finishers in yesterday’s time trial, Lina and Angie once again battled for the title, and once again Lina came out on top. Later in the evening we got a real treat: A demo race on the “WaterWolf” electric jet surfer boards. These things are basically a big, fat, really heavy surfboard with an outboard motor attached to the bottom. It was a hell of a lotta fun, even if most of us struggled to get the hang of it. A fun way to end another beautiful day in the Bavarian countryside. We’ve been seriously lucky with the weather this year: Perfect blue skies and 25-30 degrees celsius (86 F). Though ironically, this warm weather looks set to whip up a lightning storm tomorrow afternoon, which could mean an earlier start for the distance race. And what a distance race it’s going to be. Although we’ve already had two full days of racing, tomorrow’s 18km distance race is the main event. It’s where all the points are on offer for the Euro Tour Leaderboard, and it’s where the vast majority of the bragging rights are up for grabs. Won’t really be much of a spectator-friendly affair – it’s a “there and back again” style course – but it’ll be a very interesting contest for the serious paddlers. We’ve got a lot of top ranked guys here this week, which should make tomorrow’s contest a fairly intense battle. Expect plenty of jockeying early on as the inevitable draft trains start to form, though don’t be surprised if that argy bargy continues well into the middle part of the 18km race. Nobody’s going to go quietly. Though as much as the draft train positioning will help decide the race, the key moments will probably come on the beach runs. The Lost Mills course is held on two lakes that are divided by a break wall. 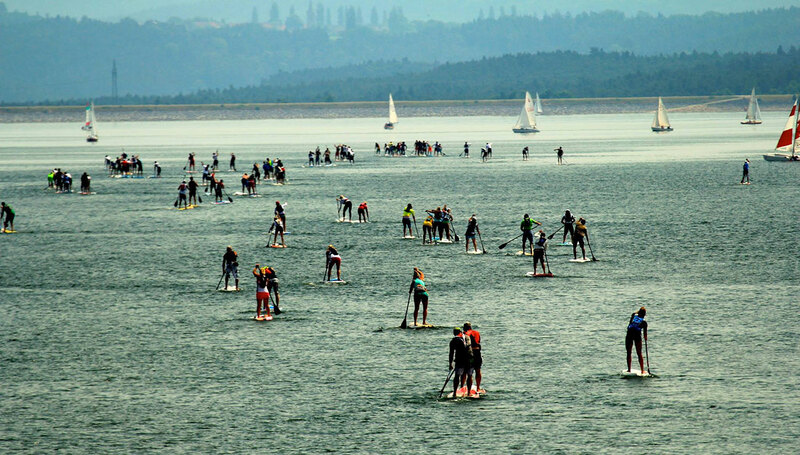 Competitors paddle across the first lake, run around the beach to the next one, paddle a loop around that, then jump back in the first lake and paddle back to the start/finish line. It’s these run legs (or “portages”) that can make or break a race. It’s where the draft trains splinter and those who are suffering lose touch with the leaders. We’ve got 12-15 guys that could legitimately lay claim to a top five spot, then another 12-15 guys that would be an outside chance of sneaking into top 10. Titouan Puyo, Connor Baxter, Georges Cronsteadt, Jake Jensen, Casper Steinfath, Eric Terrien, Trevor Tunnington, Fernando Stalla, Paul Jackson, Bicho Jimenez, Paolo Marconi, Chase Kosterlitz, Arthur Arutkin, a few names I’ve forgotten at this late hour, and then a couple of dozen European paddlers that would fancy their chances at upsetting a few of the big names. On the women’s side I’d expect Lina Augaitis, Angie Jackson, Fiona Wylde, Sonni Honscheid and Celine Guesdon to be fighting for the podium, though we’ve got another half a dozen or so very determined ladies that will have something to say about that. Again, the key points will be on the beach run, where paddlers have to pick up their board and trek around 100m over to the next lake. No matter what happens it should be an interesting battle – the stats geek in me can’t wait to see the results sheet. Look for said results to drop on Saturday afternoon. I may be a little late though, as I’m probably doing the race myself and will no doubt finish a good 20 minutes after the winner. We’ve just wrapped up Day 1 of the 2015 Lost Mills, with Trevor Tunnington and Lina Augaitis drawing first blood in the “Fastest Paddler On Earth” time trial. Trev was the quickest down the 200m, straight line, electronically-timed course here in the south of Germany, defeating Casper Steinfath, Jake Jensen, Connor Baxter and a host of other top ranked paddlers. Trevor Tunnington isn’t a name familiar to most paddling fans, however anyone following the sport closely would have noticed his rise through the ranks over the past year or two. Based in Queensland but hailing from New Zealand, the Starboard team rider definitely has a bright future ahead of him if he can keep up this sort of pace. 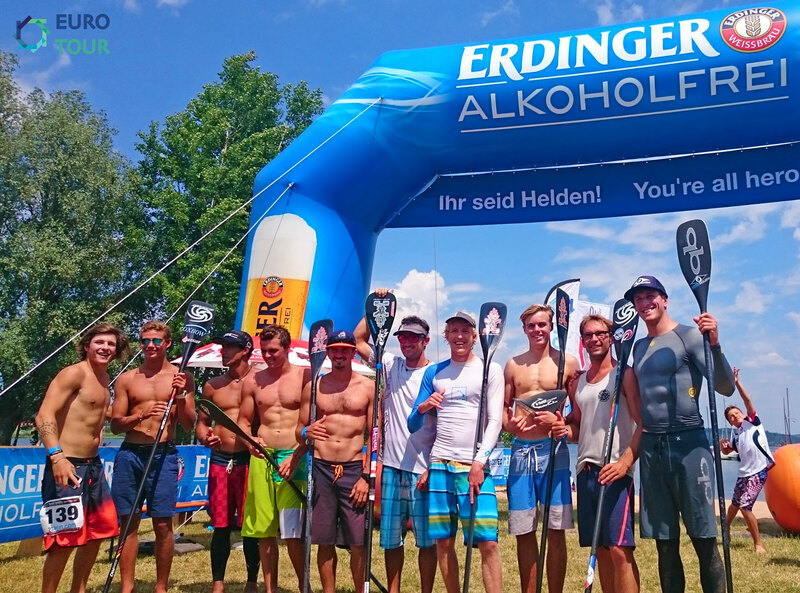 As a big crowd of local holidaymakers built up on the shores of Lake Brombachsee – which has turned into a thriving beach despite being 1,000km from the ocean – the top 20 paddlers from the qualifying round went through to the final for a second run. Qualifying second fastest in the morning heats, Trevor Tunnington lined up for the last run of the day. In the Fastest Paddler, competitors race parallel in pairs down the 200m course, which meant Trevor was matched with the fastest qualifier, Arthur Arutkin. Arthur faded on his final run, however Trev kept the pace going all the way to the line to claim victory by a solid 2 seconds. Might not sound like much, but that’s almost 5% faster than everyone else. From my vantage point out in the water, I doubt Trevor reached a higher speed than Casper, Jake and Connor at any point along his run. However what he did do was keep the pace going right to the line. Many paddlers were fading over the final 50 metres, but Trev kept a quick pace all the way. For the record he was paddling the 14’x23″ Starboard Sprint. Meanwhile Lina’s victory, which came by just 2/10ths of a second over Angie Jackson, gives the SIC team rider back-to-back “Fastest Paddler” crowns, mirroring her efforts from Lost Mills 2014. Lina looked strong all day, with the world number three comfortably beating her SIC team mate Sonni Honscheid in the morning heats before just pipping Angie’s time in the final. Just like Casper, Angie was sitting in the box seat until the last run of the day, where Lina paired with second-fastest Celine Guesdon (who ultimately finished 4th). It’ll be very interesting to see these two go head to head in Saturday’s classic distance race, where they’ll no doubt start as two of the hot favourites (though I doubt Sonni will let them have it all their own way). This “Fastest Paddler” is a great warm-up, but Saturday is definitely the main event here at the Lost Mills. Apart from these strong women, another fine performance today came from 3rd fastest Manca Notar. After the 14 foot sprints, a few of the top paddlers jumped on the one design 12’6 time trial. None of the top guns were expected to do this race, but in a bizarre chain of last minute events, organisers waved 3,000 Euros in front of the paddlers, which motivated a few big names to have a crack (note to all race organisers: Be sure to clearly communicate your prize money breakdowns before events). In a winner takes all showdown, Jake Jensen snagged the 2,000 Euro prize by just 1/10th of a second from a bummed out Fernando Stalla, while Lina Augaitis picked up another 1,000 Euro to go with her earlier victory. The 200m sprint format is interesting. Despite the short distance, many paddlers struggled to hold a sprint pace the entire length of the course. 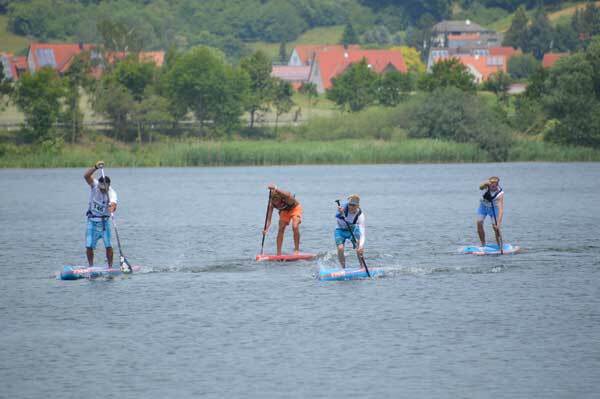 I should also note that not all the top paddlers raced today, with the likes of Chase Kosterlitz and Titouan Puyo sitting it out. Other top contenders for the distance event, including Tahiti’s raging bull Georges Cronsteadt, are only arriving tomorrow. 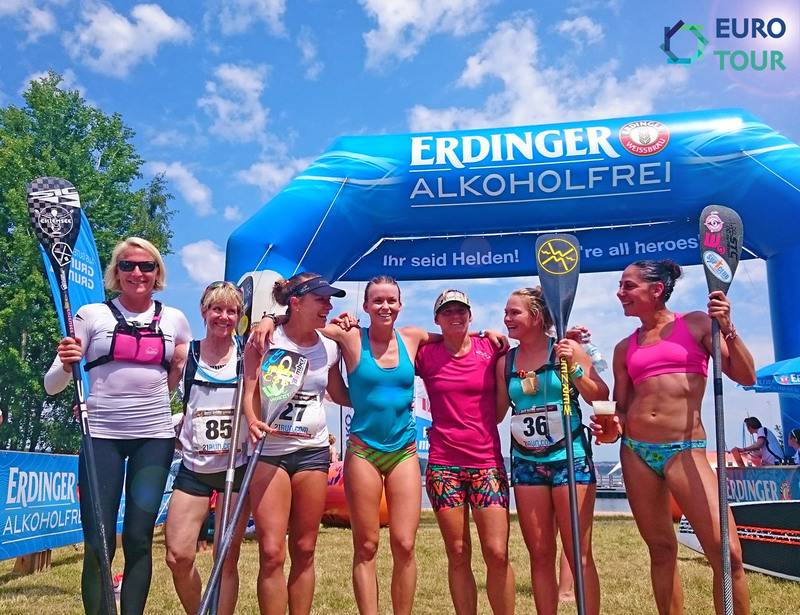 All in all it was a great start to the Week 3 of the Euro Tour, with glorious sunshine and a big local crowd cheering on the paddlers here in Bavaria. This event garnered a reputation for being wet and cold after a shocking storm engulfed the lake two years ago, however this year the weather has been epic. Looks like we’re set for more hot weather leading into the weekend, so it should be a great few days down here at Lake Brombachsee (here’s the Google Maps location in case you’re wondering where on earth we are).